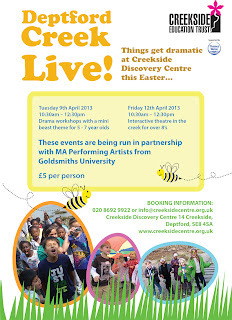 This workshop will involve drama, games, puppetry, and story- telling based around the theme of MINIBEASTS! Children will become Minibeast explorers armed with nets and bug pots they will catch and identify creatures finally metamorphosing and becoming Minibeasts themselves. 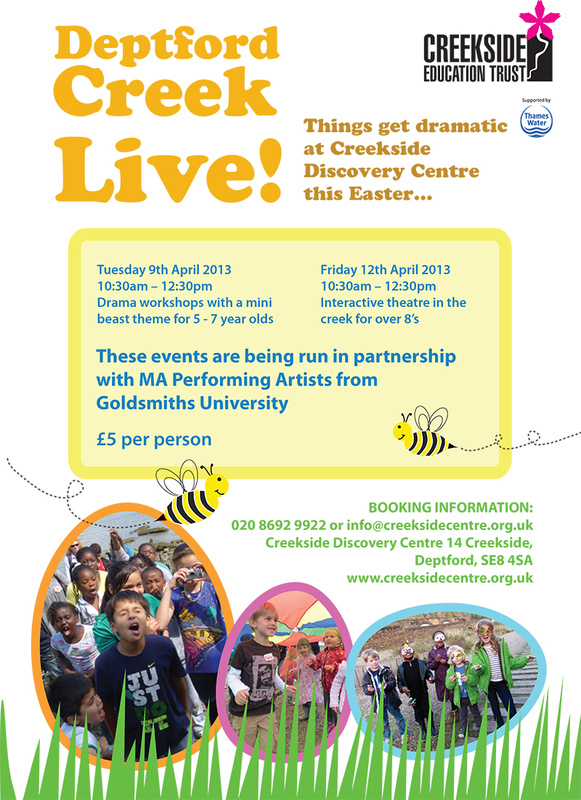 This drama workshop will involve an expedition into Deptford Creek! Through the means of interactive theatre we will be Mudlarking, telling stories and re discovering London’s lost treasures. You’ll be kitted out with waders, waterproofs and walking poles and be involved in a marvellous, muddy, melodramatic adventure. Both events cost £5 per participant and booking is essential. All Creekside staff are CRB checked. Parents can drop off children or stay and participate in the fun. Darryl at 853 Blog reports that there's a meeting tomorrow night (Tuesday 26th March) at 7pm at Davy's Wine Bar in Greenwich High Road about the possibility of setting up a rail users' group for people using the Greenwich line. A rep from South Eastern Railway will be in attendance, along with someone from the Charlton Rail Users' Group. Although the main reason for the meeting will be to talk about the disruptions that will be caused by the rebuilding works at London Bridge station, as Darryl suggests, it may also be a useful forum for Deptford station users who are unhappy with the present cleaning regime there. See also our previous post, and the Deptford Dame. Lewisham Homes' contractors MITIE were on hand at the Pink Palace on Wednesday afternoon to outline to residents the proposed works to Crossfields' homes over the next year as part of the Decent Homes programme. The Pink Palace (corner of Frankham House) has recently been renovated by MITIE and sports a brand new kitchen, so tenants were able to see how their new kitchens might look. There was also a carousel display showing the six different counter surfaces, door veneers and handles they can choose from. However, we were told that first of all tenants' homes would have to be surveyed to see the current condition of kitchens, bathrooms and toilets and whether the tenant would be eligible for an up-grade. This was a bit of a wind-up, since mostly everyone's kitchens, bathrooms and toilets on the south side of the estate have not been upgraded in 17 years, since the last major works of this kind. Did this mean that if you'd kept your fixtures and fittings in the best condition possible over this time, you would not be eligible?! Leaseholders can partake in the scheme if they can afford it, but we were told that if they did, they would have to take the whole package – that is, if you want a new bath, for instance, the job would include new tiling and flooring, basin and (fairly basic) taps and not just a new bath. Work has already been taking place at Congers, Finch and Farrer as part of Phase One. Phase Two is the rest of the estate (hopefully Frankham has not been left out) and will start in April and go on till next April. Tenants will also get new front doors – an upgrade that satisfies new Fire Safety regulations. MITIE would like to commandeer a part of the Holden area carpark (opposite the Creekside Discovery Centre) as a compound to accommodate materials, vehicles, portaloos, a site liaison office and workers' respite. The very small number of resident car owners who use this space will have to find another parking spot, as will all the non-residents who currently enjoy free parking here during the week days. Crossfields TRA have provisionally agreed to this and that the compound will be surrounded with painted hoardings, rather than the rather untidy looking alternative ('Harris fencing'). After a brief absence, Happy Mondays is back at the Amersham Arms with their usual mix of well-known comedians trying out new material, regular radio contributors who you've never seen in person, and up-and-coming jesters just starting out. More often than not the bill has a range of performers that trumps the predominantly white male comedy status quo, and is hosted by the lovely Holly Walsh (lovely as long as she doesn't pick on you in the audience!). Tickets are only £5 (including a booking fee) when you book online (more expensive on the door). 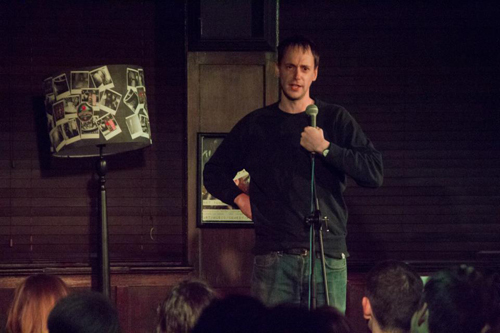 Coming up: Phil Nichol on 8th April, Josh Widdicombe on 22nd April. See the Happy Mondays page on Facebook. The Amersham Arms is at 388 New Cross Road, SE14 (opposite New Cross station). 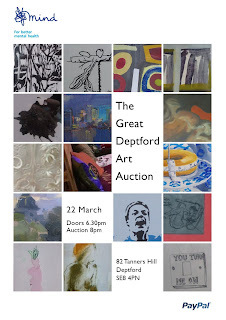 The Great Deptford Art Auction – this Friday! Neville Johnny of Deptford's much beloved Johnny's DIY & Building Supplies has organised an "upmarket" Art Auction to raise some cash for MIND. Nev's been raising money for the Mental Health charity ever since his brother Roderick died last year. It's happening this Friday, 22nd March in the new gallery space at 82 Tanners Hill. Arrive at 6.30pm to have a look at the work. The auction begins at 8pm and the auctioneer is from none other than Christies! Lots of great local artists are taking part – have a preview of some of the work they have contributed on Neville's Facebook page. The auction raised £1900 to go to MIND. Fantastic effort all round, and congratulations to Neville and all involved. An Old Bailey jury yesterday found Barry Normah of Watergate Street, SE8 guilty of killing TJ last year. He's yet to be sentenced but we can hope for justice. Pedestrian Claire Ridge was standing beside him at the pedestrian crossing before he was hit by a silver Audi A3 at around 5pm. 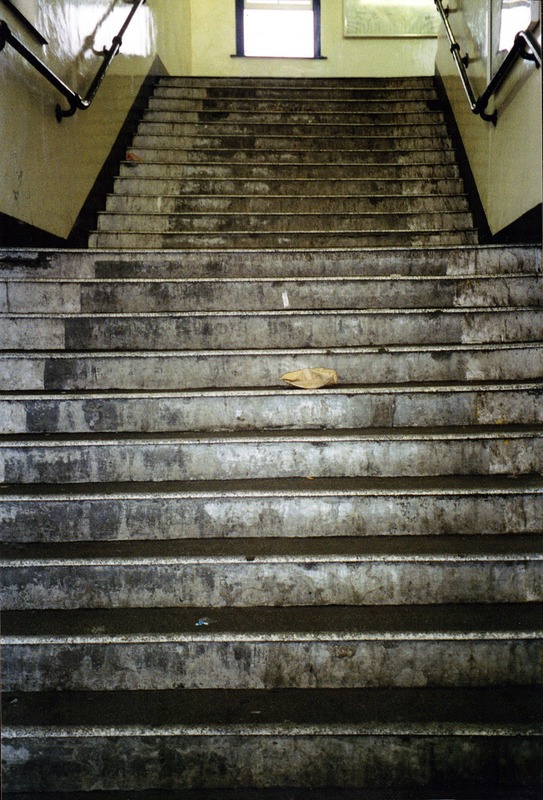 She told the Old Bailey: "A boy on a bike came to my right hand side. He crossed the road - the red man was still showing but the cars had stopped, the traffic lights were red. "Then I saw this car approaching really quickly and I thought 'what is this car doing - it was my turn to cross, it was the pedestrian's turn to cross'. "I thought it was going to stop but it slammed straight into the boy. The boy flew to the other side of the road and crashed to the floor." Jurors heard that the driver of the car initially failed to stop, continuing along Deptford Church Street, before turning around at the traffic lights and coming back to the scene. He paused for a short while before eventually driving off again. Police later found the Audi dumped in nearby Watergate Road at around 7pm. We posted more pictures showing what the station used to look like in April 2011, just as work commenced on building the new one. 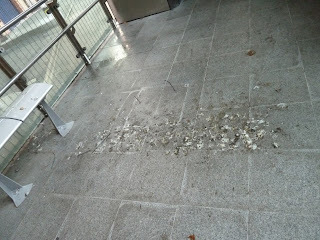 Unfortunately, since the new station opened in April 2012 (see the Deptford Dame post), a cleaning contract has not been in place, so that nearly a year later, the station is beginning to resemble the old one. A group of locals who regularly use the station have been complaining for some time now. 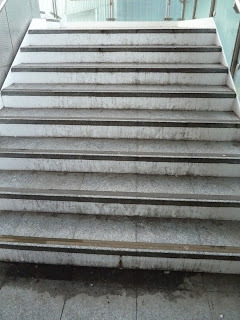 Their complaints fell on deaf ears for many months since it wasn't clear whose responsibility it was to maintain and clean the station (Network Rail or South Eastern Railway? ), and they were given the usual run around by both companies. Since the so-called increase in staffing (a cleaner pops down from Greenwich station) the manager from South Eastern reports a "significant improvement", but those using the station contend that cleaning is still not being carried out to a satisfactory standard. 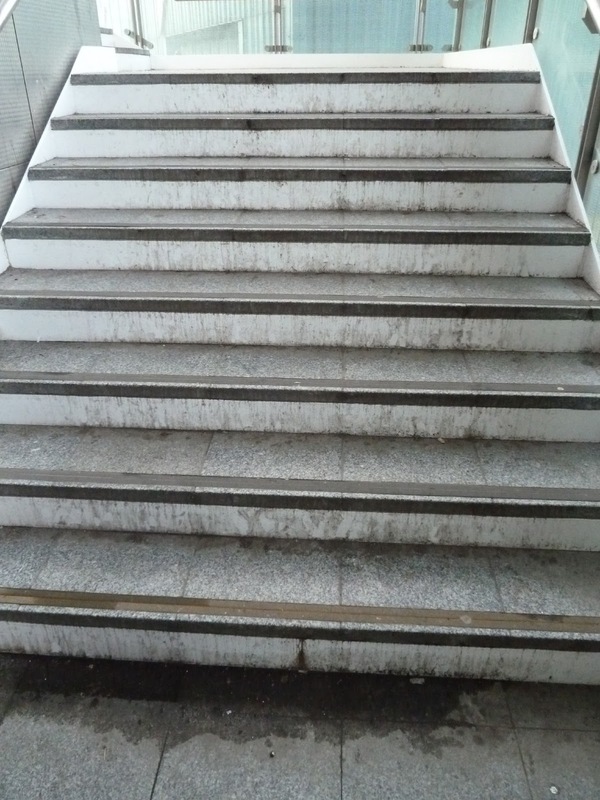 The station's architects originally specified that the station should be cleaned for 30+ hours a week, but the new cleaning regime is only 3 hours a day, plus some time at the weekend. Cleaning doesn't appear to be taking place on Sunday, so Monday's commuters must start the week walking through Saturday night's detritus. One of them commented, "The new station is an unusual building and one which requires a high level of maintenance to avoid it looking uncared for. Once a public building begins to look shabby, people begin to mistreat it...There are many surfaces and areas that are difficult to access without specialist platforms/scaffolding, and large expanses of glass which, unless cleaned regularly, really show the dirt, and stainless steel which needs cleaning to prevent rust..."
In the meantime, if you want to help get the message across to South Eastern, you can upload your comments along with a photo of the filth and mess to South Eastern's comments page. Surprise, surprise! No deep cleaning took place on Monday 18th March! An enquiry to South Eastern produced no reason, but a promise that it will take place on Monday and Tuesday 25th & 26th March. The South Eastern Railway rep blamed the behaviour of 'the public' for the neglect that has resulted in the current state of the station. In February, the South London Press also carried the story (unfortunately not available online), which may have led to local's complaints being temporarily dealt with – but so far, the bad publicity has produced very little result. Update Friday 22 March: We hear Dame Joan Ruddock is scheduled to open the station proper next week (according to some bloke working at the station) so South Eastern will really have to do a clean up after all. Also see what our other Dame has to say in her latest post. 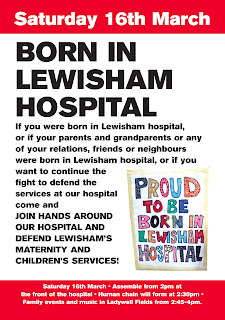 Join hands around Lewisham hospital: Saturday 16 March: 2pm at the hospital. Everyone welcome. 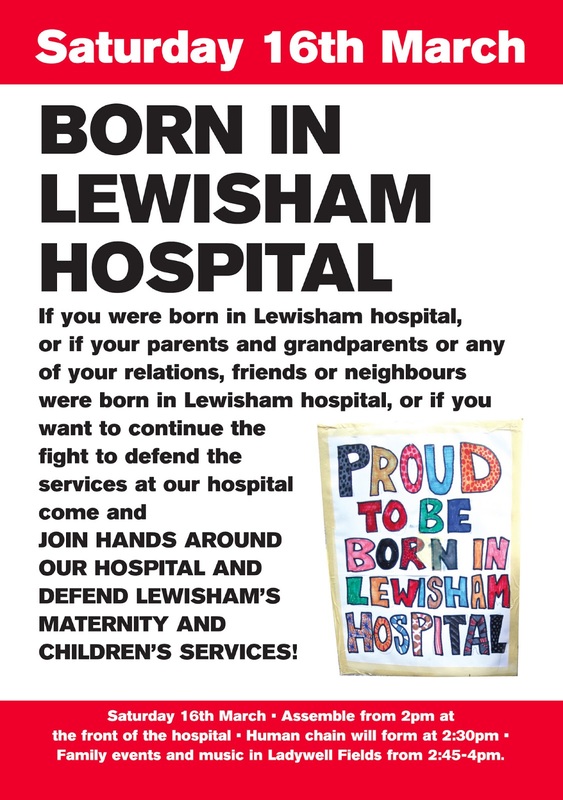 Meanwhile, last Thursday Mayor of London Boris Johnson got a very poor reception at Lewisham Theatre, in an event dominated by Save Lewisham Hospital campaigners. One of the other issues raised at the event was Boris's proposed closure of London Fire Stations, in particular New Cross Fire Station. There will be a public meeting on Thursday 14th March, 7.30pm at the Barnes Wallis Centre, 74 Wild Goose Drive SE14 5LL (off Queen's Road, rear of the fire station). The Fire Brigades Union will put their views alongside Len Duvall (GLA), Cllr Paul Bell and Tony Reay from Lewisham Trades Union Council. Transpontine has more details. An quick message from Awra Amba, an egalitarian village in Northern Ethiopia, where men and women enjoy equality at home and at work. The new Rivers & People programme is out – pick one up in the library, click on the image below, or go to their website to find out the opportunities to explore your local rivers for FREE over the coming months. The next walk is a trek out to Kelsey Park to look at one of the largest heronries in London on 12th March. The walks along Lewisham's waterways run until July, with the last event marking the end of the Rivers & People project. The project has been run for the last three years in association with Creekside Discovery Centre (14 Creekside). The Centre also runs low-tide walks in Deptford Creek – the next one is on March 17th. Check out their website here. Crossfields is about to benefit from Lewisham Homes' Decent Homes programme. Tenants will be contacted individually regarding internal improvements – new kitchens and bathrooms, rewiring and heating. External works to the buildings and communal areas will also be carried out, should they be deemed necessary (there is probably not much that needs doing on a Major Works scale). Millwall FC's legendary terrace chant "No one likes us" seems an apt slogan for Convoys Wharf developer Hutchison Whampoa to adopt (though the club may not wish to be associated). Not because Hutchisons have captured the spirit of Deptford (far from it), but because no one likes their development – and they don't care. At their presentation at The Albany on Saturday (and at Charlotte Turner School the previous Thursday), Hutchison's representatives Hard Hat, plus Farrells' architects, transport consultants SKM Buchanan, archaeological consultants Baxters and landscapers Grontmij, were full of helpful friendliness as they showed off the latest masterplan. Rather like the smiling cowboy shaking hands with the native American before corralling his people off into reservations. Especially since the other billion dollar corporate company who are partners with Hutchison Whampoa in this development are Murdoch's News International, who own a profit share on the sell off of various components of this site – ie the luxury flats. All 3000 of them (discounting the so-called 'affordable' ones). At first glance there didn't seem to be any changes since the last presentation in July 2012 at Deptford Lounge – except the exhibition boards now presented a cohesive story (with some developer spin), replacing the mostly 'post-it note' styled display of historical research that was shown before. One local who must've seen the exhibition on Thursday at Charlotte Turner School arrived at the Albany with an oblong of polystyrene to add to the large model. His intention was to show how tall the towers would really be and how deceptive the model is. 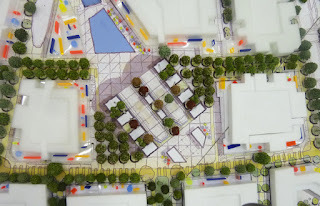 It really is about time the developer stopped bringing out this 'street level' model in their public presentations. Some visitors came away with no idea there were three towers. There are still 3,500 flats in a dense and tall arrangement, and although the parking spaces have been slightly reduced, they still number 1700, potentially creating an enormous strain on Evelyn Street, Lower Road and Creek Road. The parking will be housed in two storeys (known as 'podium parking') in many of the buildings, creating an inhospitable streetscape (walls of nothingness) in places where no retail outlets are proposed (shops are shown as brightly coloured shapes on the model). The podium parking could not be understood by looking at the model. There were no building designs to look at, and no street views to give a sense of place, other than fantasy illustrations of public spaces – including one that shows a young woman sitting on the quayside with her legs over the side (a totally unrealistic proposition!). Many locals are concerned with the transport situation, and Evelyn Ward's Cllr Crada Onuegbu was overheard presenting the case to the guy from SMK Buchanan. 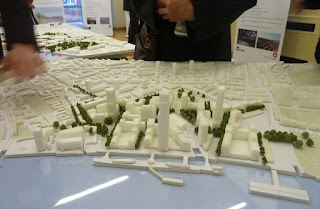 (The event also happened to coincide with an Evelyn Ward surgery at the Albany, but there were no New Cross Ward councillors in attendance, even though the development impacts on the whole of Deptford). The developers estimate only 10% of new residents will use the new riverboat, and that all the new cars (1700) will not be driven in rush hour (even though 300 of them are for non-residents), but there are no plans to increase capacity at local stations. There is now only one bus stop on the site. Hopefully, with an up-and-coming by-election in Evelyn Ward, the councillor will keep plugging the concerns of her constituents, since the time is approaching to let Lewisham planners know what we think. Affordable housing is still only 14% (500 out of 3500 homes). L&Q are onboard – one of the largest (and possibly the most awful) housing association in South London. New government rules will mean they can charge up to 80% of market rent for the 'affordable homes' in their portfolio, and they are just the sort of housing association who will. "There will be a mix of market, rented and shared ownership tenures" says the exhibition board. What percentage of the 500 homes will actually be rented at Lewisham's definition of 'affordable' (60% of market rents) is anyone's guess. According to the exhibition boards, the employment opportunities are covered by an employment specialist company called Reds 10 who promise to "develop their strategy for training and employment that will prioritise jobs for local people. This strategy will be developed in partnership with Lewisham Council and local community skills and training organisations. Around 1000 construction jobs will be created as well as 1500 long term jobs." Local people will be cynical about the construction jobs, having been excluded from recent opportunities (as heard briefly at the last Evelyn Assembly meeting). Hopefully, Lewisham's backing of this agency will improve opportunities, but jobs are still confined to "construction, hospitality and retail". Meanwhile, the reason given by the developer for fitting 3500 flats into a space too small for them is that Lewisham Council wants this number, as laid down in their Core Strategy. It's about time this number was flushed out – Lewisham needs to confirm whether the number of units is required by them – or is it simply a figure the developer won't back down on. Unfortunately no one from Planning was there (at Charlotte Turner School on Thursday or the Albany on Saturday) to answer. The main architectural model looked the same as last time and as deceptive as ever. The 'ground floor level' plan model made every building look like a bungalow, with oversized model trees the height of two storeys further deceiving people's perception. (A fully matured tree would take many years to reach anywhere near this sort of height). This big model was supposed to be viewed in conjunction with another smaller model. 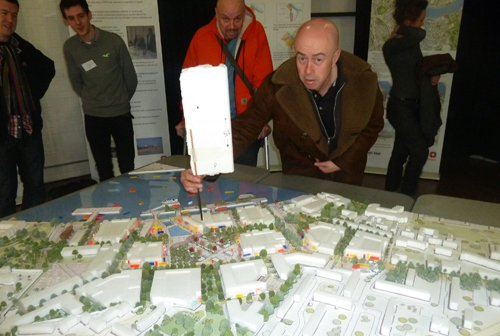 The smaller model – which had been expanded since July to include the larger area surrounding it – showed the heights of buildings, but was too small to make sense. The smaller model was also turned in the opposite direction, making it almost impossible to refer to so that anyone could work out which of the 'bungalows' on the large model were actually towers or 12–14 storeys (or higher). An exhibition board said the towers would be 32, 38 and the tallest 46. Below, a closer look at the smaller model shows the 'Z' building (aka Aragon Tower) down on Pepys (right) in relation to the tallest tower on the Convoys site (left). The main selling point seems to be public access to the river, with a marvellous new waterfront pier (and eventually a riverboat stop). On either side of the development, two long slim areas that used to be slipways for the ships that were built here in the 17th– 19th centuries, will be public areas. The easterly one has been excavated and is 'protected' from development; it's suggested it will make a natural public ampitheatre (it's also the Lenox Project's preferred site). The westerly one is liable to be a shaded wind tunnel, due to the height of the surrounding buildings. At the centre of the development is the Olympia Shed, a listed building. Although the height of the buildings on the waterfront and on the outside of the site have been lowered, they now rise towards the centre, dwarfing the listed building. As yet there is no concrete proposal for this building other than to be accessible to the public. The massive space could have mixed uses ("leisure, retail, cultural and amenity"), but the top honcho at Hard Hat totally ruled out the ideas of a museum dedicated to Deptford's important maritime and industrial history, or a boat building project. 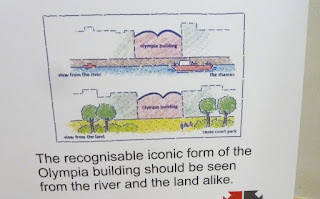 The Olympia Shed is shown on the model as a tree lined area. Less informed folk might have thought it was a big public square, but it looks like this because apparently it will have a glass roof (with trees inside). To the left hand corner of the picture above (looking north to the Thames) the historical Great Basin has been reduced to a shallow pool with a see-through sweet shop next to it. That is in fact a 14 storey building. 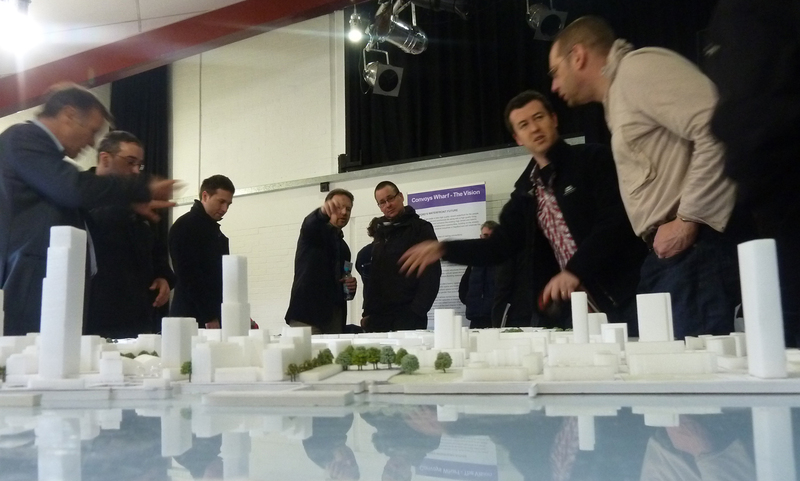 A company called FutureCity has been tasked with Cultural Placement on the site. According to the exhibition boards there are "Seven Key Projects for Convoys Wharf identified which Hutchison Whampoa hope to realise through engagement with local cultural stakeholders, individuals and institutions via an advisory group and project specific working groups. 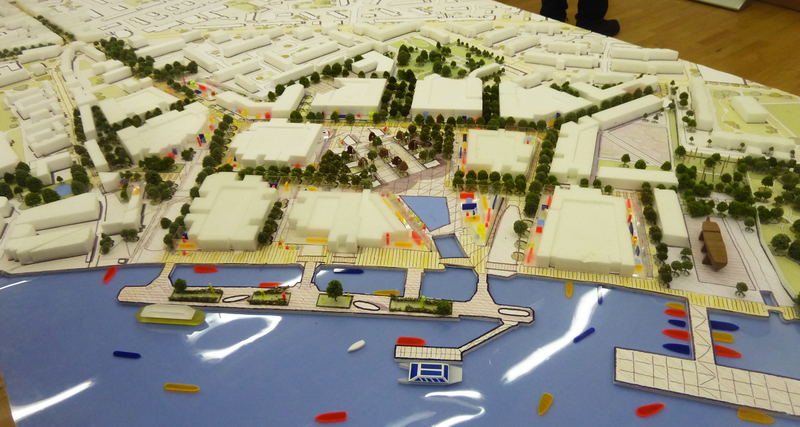 FutureCity have been meeting with key stakeholders in the local area to discuss how the Convoys Wharf masterplan will come forward over the next 10-12 years, to embody these pledges in a way that engages and involves the wider community". Contrary to the statement above, FutureCity have not been meeting with key stakeholders as of yet (though they are not new to Deptford or Convoys Wharf and have in the past had conversations with The Laban and Albany). There's a sense that someone has been brought in to tell us what our culture is. So now is the time to get involved. See their website contact details to get on their mailing list. Local groups of all kinds are 'cultural stakeholders', and should be part of the plan. FutureCity work with developers mostly to put arts projects (including festivals and events) in public spaces. They have many developers on their books, including Battersea Power Station. They were last properly engaged in Deptford with Paynes and Borthwick Wharf. This involved promoting the work of local Deptford artists and designers in an online showcase with an unpaid contract that allowed FutureCity to promote itself using those artists' images with no royalties. 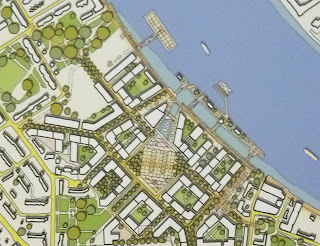 FutureCity was also involved with Deptford X but it was not a happy relationship by all accounts. Perhaps lessons have been learned on both sides. 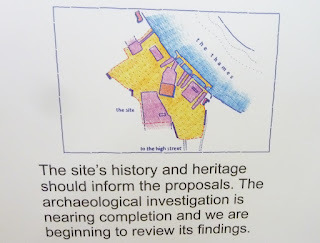 All the historical research that Farrells supposedly did at the beginning of their relationship with Hutchisons seems to have resulted in only gestures towards the site's rich history. Locally initiated projects are still included in the masterplan, as the only representatives of the wealth of this history. The Lenox Project boat was positioned on the model in the same place as in the July exhibition, on the 'protected wharf' at the westerly end of the site next to Pepys Park. We understand this is not where the project wants or needs to be built – for many practical and financial reasons. The blurb on one of the wall panels claimed to "have been in discussion with the Build The Lenox group" but the group are apparently still waiting for a meeting. 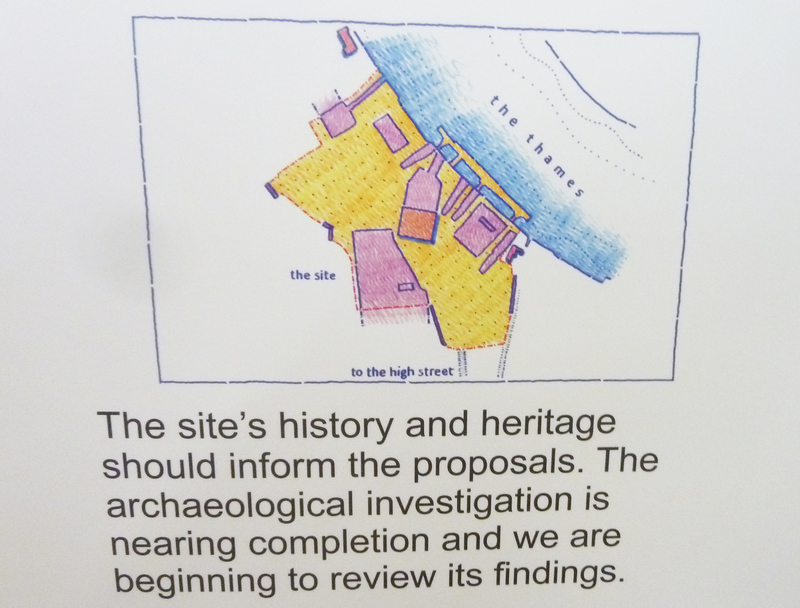 The Lenox Project would like their boat to be built where it was originally built, on the east of the site in the protected Dry Double Dock, close to Greenwich. A "Double Dry Dock Park" is planned here instead. The far westerly position given to the project would mean the ship couldn't be built according to the original plans (the main point of the project) but would have to be considerably adapted so that it could be hoisted by crane into the Thames, instead of slipping naturally out of dry dock into the river. Hutchison Whampoa's spokepeople were also adamantly opposed to the alternative siting of the Lenox Project in the Olympia Shed. This is not the Lenox Project's ideal site, but if it were built in the shed, it would need to be launched into the Great Basin that ships were historically launched into. 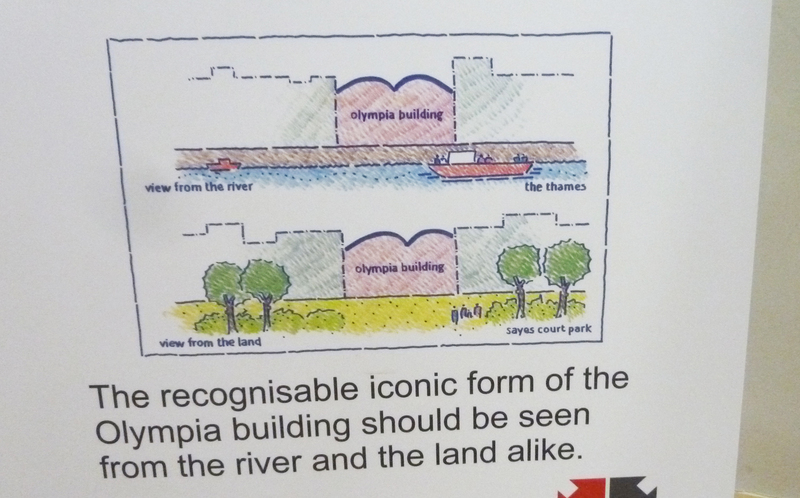 The developer's exhibition panel below shows the area of water in front of the Olympia Building that once led out to the river (the pink funnel shaped area above the red box shape), but this has now been reduced to a couple of small blue shapes – to include a much smaller 'mirror' pond that will 'reflect the buildings around it'. It also enables more buildings to be fitted in. 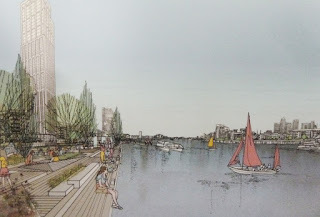 The Lenox Project has also proposed that the 'protected wharf' at the west end of the site (next to Pepys Park) becomes a Marine Enterprise Zone, producing all sorts of other job and training opportunities not related to construction, retail and hospitality. The developers would like this area to be as light industrial as possible, whilst the PLA (Port of London Authority) like the idea of industrial freight use. 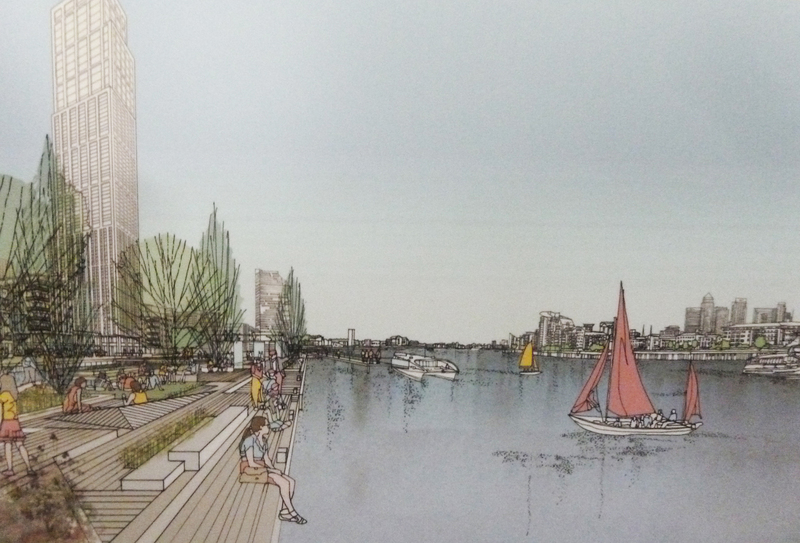 Perhaps this is why the Lenox Project has been placed here, to avoid arguments over the use of the wharf. Meanwhile, the Sayes Court Garden project have been given a little of what they asked for, as they were in July. Now their proposed John Evelyn Study Centre has been moved to be housed in two storeys on the corner of a six storey 300-bedroom hotel, opening out onto a new square adjacent to the already existing Sayes Court Gardens. 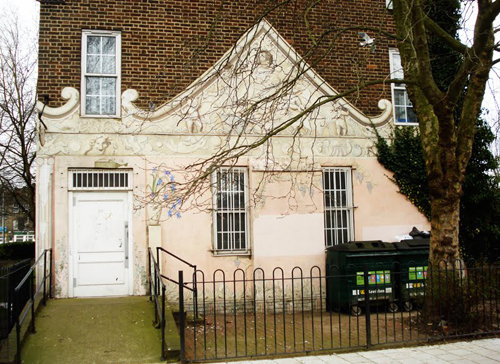 Inside, the archaeological remains of Sayes Court Manor House will be exposed and there will now be a building-free avenue leading to the Olympia Shed, but a new primary school is proposed on the rest of the historic garden site. 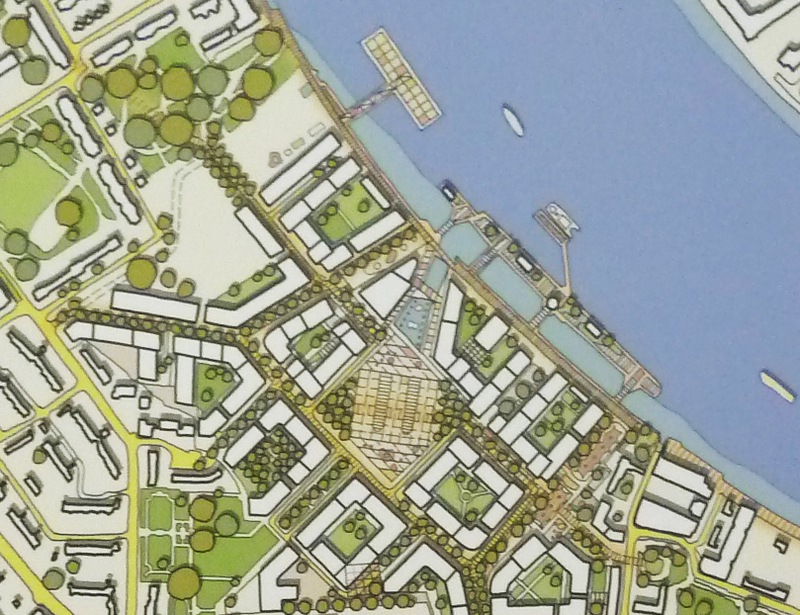 Incidentally, many of the green areas shown on the drawing above are actually raised private gardens inside the perimeters of the luxury housing blocks, so the only really green public areas on the whole site are three pedestrian corridors and the existing Sayes Court Garden. Another misleading part of their presentation. The architects and other representatives of Hutchison Whampoa presented their plans with extreme confidence, and ever-so politely waved away locals' concerns with a "Don't you worry, we'll sort that out, it's still early stages", whilst also creating the impression that everything was now set in stone, like it or lump it. What was not made clear is that Outline Planning Permission can be granted without a lot of things being finalised. The application might be submitted any time in the coming months – the developer optimistically hopes to start building in 2015. Visitors were invited to fill out feedback forms, but God knows where that feedback will end up. A report on a consultation which took place with Evelyn Ward residents back in 2008 paraphrased comments to show only positive feedback. 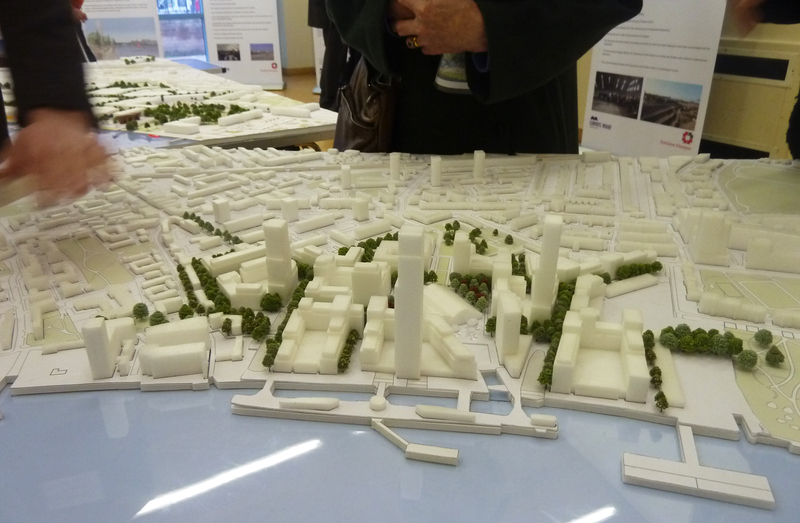 The Deptford Dame's report – she points out it is not just locals who dislike the plans, but also a range of professional bodies.